The price is right: shoppers at GUM are happy to pay more. 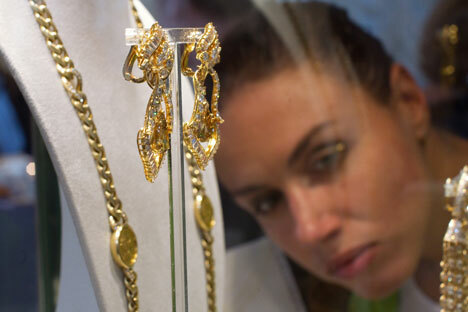 Wealthy shoppers untroubled by rising cost of expensive imported goods. Sparkling Christmas decorations line the shop windows of GUM, central Moscow’s exclusive mall overlooking Red Square. At Louis Vuitton, a middle-aged woman eyes a beige hat with a price tag of 24,100 rubles (£240). "Don’t they have something with a more prominent Louis Vuitton monogram?" she asks the shop assistant. Rich Russians have a reputation for being brand addicts, but the country’s luxury market has not had it easy this year. With the economy now showing signs of fragile recovery after a year in recession, the Kremlin has presented the economic crisis as an opportunity to boost Russian manufacturing. But with no domestic alternatives to western luxury brands, such as Chanel or Cartier, the premium market has had no choice but to continue to import, despite a doubling of costs in ruble terms. Retailers are absorbing some of those costs, hitting their margins. The luxury clothing sector is expected to contract by 20-25 percent this year to £1.7bn ($2.5bn), down from £2.1bn last year, according to the Fashion Consulting Group (FCG). For the industry, it is like stepping into a time machine and travelling back to the aftermath of the financial crisis of 2008. Compared to its mid-market competitors, however, the luxury clothing sector has weathered the storm well: its market share in 2015 remained constant at 10 percent, FCG said. With the buying power of wages down roughly 10 percent over the past year, middle-class Russians on a payroll have shunned mid-segment retailers in favour of budget clothing stores. But most wealthy Russians weren’t fussy about the price tag to begin with. A saleswoman at Louis Vuitton said that the shop was quieter than in previous years, but that a loyal core of a dozen or so wealthy customers continued to visit regularly. Even when items were cheaper overseas, they preferred to purchase them in the Moscow shop because of the “comfort of buying at home”, she said. What the luxury clothing sector is suffering from is an outflow of sporadic buyers – highly paid professionals and casual customers – but they constitute a minority, Lebsak-Kleymans adds. The spending habits of Russia’s elite spreads beyond the country’s borders. Russian spending abroad dropped dramatically this year, with a 41 percent year-on-year fall in September, but Russians still constitute the third largest group of tax-free shoppers, mainly because rich Russians continue to buy, according to the tax-refund company Global Blue. Russia’s car sector, once one of Europe’s most promising markets, shows a similar trend. The car industry has been among the sectors worst hit by the economic downturn – sales fell by almost 40 percent in 2015, according to figures from the Association of European Businesses. But Porsche, which has its largest Europe-based dealership in Moscow, saw a 26pc increase in sales in the first three quarters of the year. Toyota also sold 6pc more Lexus cars, and Bentley opened its third dealership in Moscow in the spring – with Russians reportedly figuring strongly in pre-orders for its opulent Bentayga SUV, which sells for around $220,000 (£147,000) in the US. A further drop in luxury spending seems unlikely; this year has already seen the rich trim the fat off their wish lists. At Moscow’s exclusive TsUM department store, a woman clad in fur insists she has been forced to cut back. “Just down to the essentials,” she says, pointing to three extra-large bags filled with luxury-brand clothes for her six-year-old grandson.